San Francisco City Hall. Photo by flickr user Sergio Ruiz. Local government is having a moment. As the role of the federal government in supporting some of our greatest needs — like affordable housing and transportation — continues to decline, cities are taking on a larger role in solving their own problems (and the world’s). Yet local government is often low on resources and designed to weather or resist change rather than embrace it. Meanwhile, the public’s trust in government is at its lowest in decades. Enter City Hall Fellows. Since 2008, the program has placed college graduates in local governments around the U.S, pairing each fellow with a public agency and a project over the course of nine months. 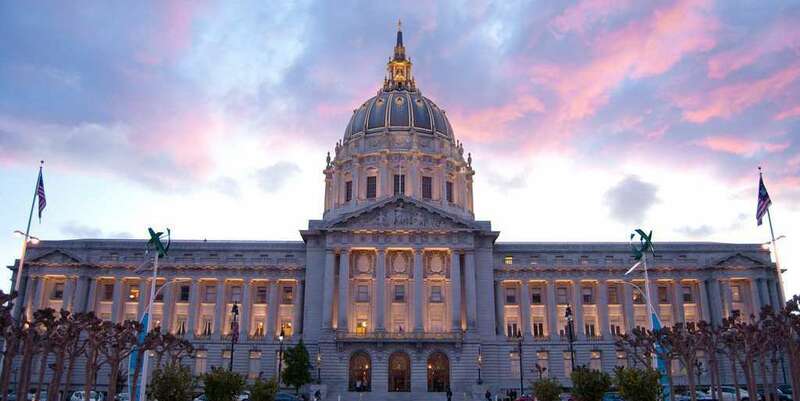 Now the fellowship has become a permanent program in San Francisco, and City Hall Fellows has evolved into a national network to support a growing generation of public sector professionals. At a recent SPUR forum, former fellows and city employees discussed their experiences and advice on what it takes to make change in local government — both how to have impact as a citizen and how to make innovative changes in government from the inside out. The panelists all spoke about making impact by making government more accessible to the public. Susan Ma was raised in a non-English speaking household by parents who owned a small business. She helped her parents navigate confusing permit requirements and made most of the phone calls to ask for help. Now at the San Francisco Office of Economic and Workforce Development, she supports production, distribution and repair businesses and works to make government more customer oriented. She has led an effort to share information on city requirements in multiple languages and has brought agency officials into neighborhoods to meet small business owners. In the San Francisco Mayor’s Office of Innovation, Krista Canellakis focuses her projects both on making it easier to access government services and solving internal public agency challenges. In 2015 her office partnered with the Mayor’s Office of Housing and Google to develop an online search platform for anyone applying for affordable housing in the city. The portal has revolutionized the city’s housing lottery system: it keeps all applications in once place; helps identify and connect people with the right housing as well as housing assistance they qualify for; and provides the city with information on the kinds of affordable housing it should be building (SPUR honored the DAHLIA housing portal team with a Good Government Award this year). Local government employees have to work hard to convince people that government can be a force for good and not wasteful, corrupt and tone-deaf to people’s needs. It starts with trust. Susan described the difference it made to bring agency staff out into neighborhoods to meet and hear from small business owners. Jason Mitchell has made data and information central to how the Oakland Department of Public Works (DPW) communicates and builds trust. The work he’s done to upgrade technology systems has not only improved his work crews’ efficiency but also gone a long way in helping DPW communicate its impact. Jason described the power of using data in “storytelling,” both to explain how and where Oakland spends its tax dollars and to build the case for more public investment. Now the city is going a step further and incorporating equity into its capital budgeting process to asses where the city has underinvested in the past and shift priorities to meet longstanding needs. Building trust with the public is essential — but it’s not enough. To make real change in local government, you also have to build a work culture that embraces it. The panelists agreed that one of the hardest but most important parts of their work is building trusting, collaborative relationships with their colleagues to magnify their impact. Krista explained that the process of prototyping the housing search portal was designed as much to build trust and buy-in among staff as it was to deliver a quality product. Jason described his work to convince staff that data could benefit them, and Susan described working to convince multiple departments who provide workforce training that they should share data. Ultimately, those making the greatest change within local government are multiplying the creative capacity of everyone around them and building trust in both directions. Faced with well-established systems and rules, you have to be patient to make change — and persistent. Write down every idea you have, but be prepared to juggle them all until the right opportunity comes along. There is little incentive to innovate in government, and at the same time, little tolerance for government to fail. Krista works to change that narrative by framing her projects to her colleagues and the public as experiments and opportunities to learn. Meanwhile, you have to hold an unshakeable idea of what’s possible: that government can deliver, that the transportation system (or the small business program, or public works or housing assistance) can be professional, reliable and intuitive, that government can make budget and meet the public’s needs. Finally, match your persistence with an embrace of the long view. It can take a long time to see change in local government. And government can — and should — hold the long-term vision. Government can be the deliberate force of progress. For the panelists, there’s no better place to change the world than in local government, maybe now more than ever.